So I haven’t eaten dessert for weeks, and as you know I don’t really give a hoot about sweet things but this was delicious – teamed up with a rainy evening, Midnight Cowboy DVD and my favourite person to stay home with on a Saturday night – a winner! This is easy as pie. I mean crumble. This was a beautiful fruit combo but you could substitute almost any fruit. I had these getting very ripe in my fridge. is to simply arrange your fruit in a shallow baking dish (mine was a one inch deep 20cm ceramic pie dish) and sprinkle with castor sugar. 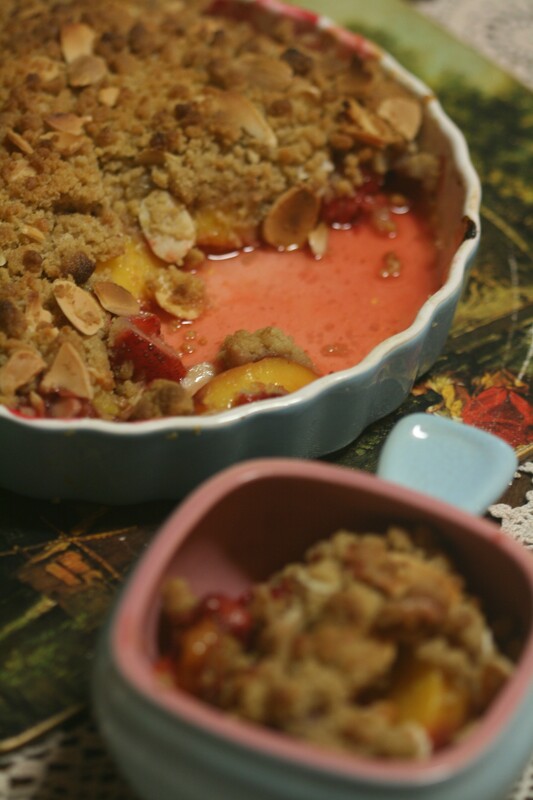 Leave to macerate a little while you prepare the crumble. Place all ingredients except the almonds in a stand alone mixer bowl, or a medium mixing bowl. Make sure the butter is very cold for best results. Process (on medium speed) or rub between your fingers until you have a large-ish crumble (if it is too fine, like breadcrumbs, the top will not go crunchy). 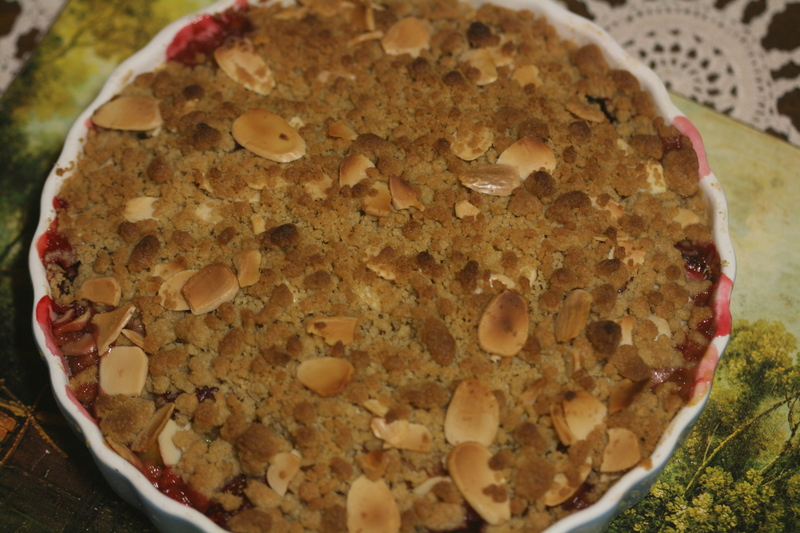 It’s not a very enticing example but the crumble should be about the consistency of gravel. Fold through the flaked almonds. 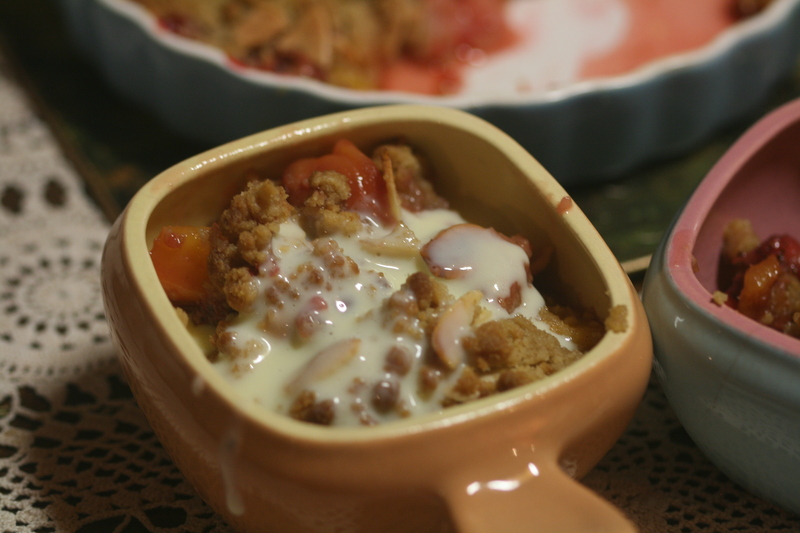 Sprinkle the crumble over the fruit – do not press it down – it should be a loose, even, thick layer. or until the fruit starts bubbling around the edges and the top is a deep golden brown. I served it with yummy home-made custard – whisk 2 egg yolks, 1 tablsepoon cornflour, 1 tablespoon castor sugar thoroughly, pour over 250ml’s hot (almost boiling) milk – whisk vigorously. Pour into saucepan and stir over medium heat until thick. Refrigerate. I am an amateur food blogger from Australia! I would love your feedback on my blog.